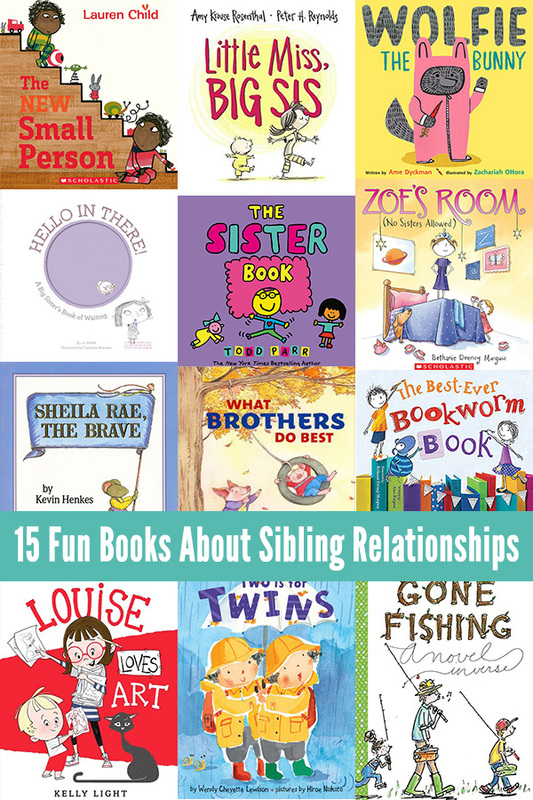 Great books about siblings – super springboards for talking about sibling issues or to simply celebrate having brothers and sisters. Sibling relationships provide some of the deepest bonds we share. Each relationship is unique, but you will often find common themes that pop up at one time or another. Jealousy, love and togetherness to name just a few. 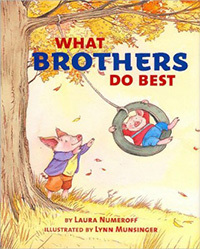 This books about siblings explore both the good and the bad of having brothers and sisters, making each a great springboard for talking through sibling issues, or read them as a celebration of the wonderful bond between brothers and sisters. 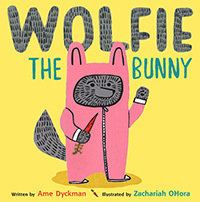 Wolfie the Bunny by Ame Dyckman is not your typical tale of sibling rivalry. Dot’s mama and papa are besotted with the baby wolf who has been left on their doorstep but Dot is sure that he is planning to eat them all up! Her protests fall on deaf ears and Dot can never quite relax with a wolf as a sibling. Until one day Wolfie is threatened and Dot must save the day…and her brother. 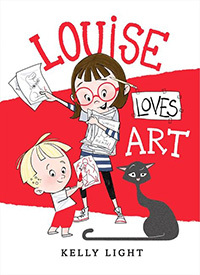 Louise Loves Art by Kelly Light is the story of Louise who adores creating art. While she busily sets up her home art show, she doesn’t know that her little brother, Art, is making his own creative works. At first, she is unhappy that her masterpiece has been used as a canvas for her brother’s creation. But, she soon embraces his work and deems it ‘best in show’. 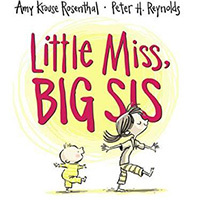 Little Miss, Big Sis by Amy Rosenthal explores the many different feelings and emotions a big sister feels as she welcomes and grows to love a new sibling – from before the baby is born right through to being the big sister of a toddler or pre-schooler. In Zoe’s Room (No Sisters Allowed!) 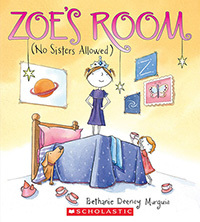 by Bethanie Murguia Queen Zoe is terribly dismayed when her parents decide she must share her kingdom (aka her bedroom) with her little sister, Addie. Unsurprisingly, things don’t go so well for the sisters until one night Zoe realizes that having her sister there mightn’t be such a bad thing at all. 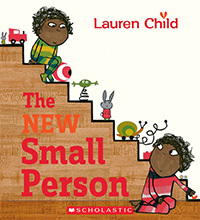 Elmore enjoys being the only child in The New Small Person by Lauren Child and then everything changes. A new little small person enters the scene and Elmore no longer has privacy or the attention he once had. The small person follows Elmore everywhere and wants to do everything he does. Then one stormy night, everything changes again and Elmore realizes that Albert really isn’t so bad. Being a twin adds another layer to a sibling relationship and finding books about twins can be a challenge. 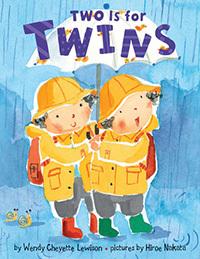 Two is for Twins by Wendy Cheyette Lewison is a simple book that would work great for little ones. It celebrates all things that come in twos and the fun that you can have with two kids including two birthday cakes! 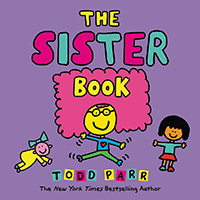 The Sister Book and The Brother Book by Todd Parr celebrate siblings of all different kinds in Parr’s unique style – perfect for big and little brothers and sisters. 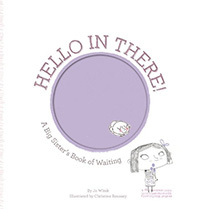 Hello in There: A Big Sister’s Guide to Waiting by Jo Witek is about one big sister who is so excited about her new role that she’s starting early. She sticks close to her mama so she can sing songs to her sibling-to-be and explain all the great things waiting in the outside world. 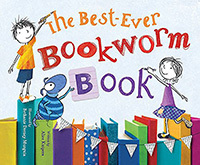 Violet & Victor’s The Best Ever Bookworm Book by Alice Kuipers are twins who set out to write the best book ever. They create a story about a hungry bookworm who sets out to eat all the books in the library. Sibling rivalry and cooperation are both present in this story. 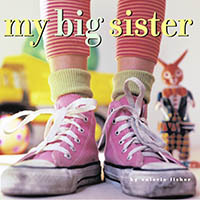 One of the neat features of My Big Brother and My Big Sister by Valorie Fisher is the photographs used for illustrations. Each story is a baby’s perspective of their older sibling. These would make neat books to help older siblings see what their new baby sibling thinks about them. 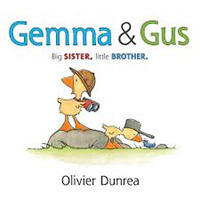 Gemma & Gus – Big Sister, Little Brother by Olivier Dunrea is another one that works well for younger children. It seems like the little one always wants to follow the older sibling! 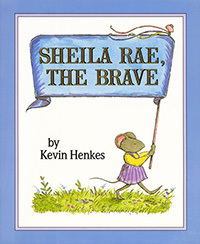 Sheila Rae, the Brave by Kevin Henkes is the story of Sheila, who is very brave. Until one day she gets lost and it’s up to her little sister (who Sheila thinks is actually a scaredy-cat and not very brave at all!) to save the day. Gone Fishing by Tamera Will Wissinger is a very interesting book. It’s a novel in verse. My 4 year-old has loved listening to me read a little each night from this book. 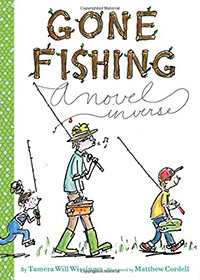 In the story, Sam is about to embark on a fishing trip with his dad, but then his pesky sister, Lucy, decides to tag along. The story alternates poems back and forth between Sam’s perspective and Lucy’s ideas. One of the really neat features of the book is the poet’s tackle box at the end. It is filled with writing techniques for the budding writer. What other books about siblings would you add to this list? "Happy Birth Day" "A Baby for Grace" and for older readers "Superfudge" and "Ramona the Pest"
Nell, I love Superfudge and Ramona the Pest! How about books for younger siblings to help them deal with the older sibling? Are there any books for them?